Providing the solutions to the challenges presented by a pipe burst scenario is what Zack Cohen and his water damage Inglewood team with 911 Restoration Los Angeles take on every day. The solutions to the challenges that water damage related concerns cause can only come from a high level of experience and skill at the restoration business, and Zack has this in spades. “We’ve been extracting water from flooded homes, fixing pipe bursts, water heater malfunctions, and all other manner of water damage for long enough to perfect our skills and give people back their homes quickly and efficiently at a great value,” Zack says. Part of what makes Zack and his water damage Inglewood teams so good is because they know that fast action is required in these situations. That’s why Zack and the water damage Inglewood experts will arrive within 45 minutes of an emergency call for water damage help. Additionally, Zack and his water damage Inglewood team are always available 24/7/365 to abate the effects of water related challenges no matter when they occur for homes or businesses. “We’re ready and strategically placed with mobilized equipment and tools to handle any job anywhere at any time,” Zack explains. 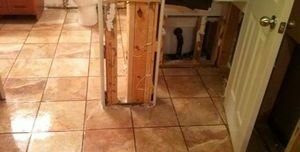 If your home is already facing a water damage challenge and you want help from the best in the business, then don’t hesitate to contact Zack and the water damage Inglewood team with 911 Restoration Los Angeles today! When it comes to saving homes from water damage from any source, Zack and the water damage Inglewood team with 911 Restoration Los Angeles are the tried and true experts and this is why people rely on them for help when water intrudes, or to prevent it from doing so. “People call us all the time for help with their water damage situations, but they also call for help preventing them too,” Zack says. Have your home plumbing system inspected at least once every few years to make sure that anything small is noticed and fixed before it causes more challenges later down the road. Make sure to check for rusting or corrosion on pipes in your home. Inspect the hoses and fittings on your water-connected appliances for wear and tear that may result in a rupture when under pressure. If you live near the water it is best to keep your home painted with fresh coats at least once a decade to make sure that salt water corrosion doesn’t eat away and dry rot your home from within. “There are a number of other techniques that people can use to keep their homes safe, dry and cozy throughout the seasons and even in an arid climate like Inglewood,” Zack says. If you are having a water damage related concern at present, or if you’d like to learn how to prevent them in your home, then contact Zack and the water damage Inglewood team at 911 Restoration Los Angeles today! Zack and his water damage Inglewood team have been providing solutions to all different kinds of water related challenges for their entire careers from small jobs to large commercial structure restorations, they can handle it all. “We took on one project recently where the homeowner simply tried to flush too much at once and then didn’t know how to stop the toilet from running when it got clogged,” Zack says. A toilet overflow is an extremely common concern that Zack faces regularly and on this occasion the damage had spread quite a bit before the homeowner made the call for help. “Those knobs on the wall behind the toilet regulate the water flow to it, and I had to explain how they work before getting to the job site and handling the water damage concerns,” Zack explains. After Zack arrived on site to extract the category three water from the toilet overflow situation, he then uprooted the carpet, padding and the affected soaked drywall as well. Ultimately this simple toilet overflow would cause some serious water damage challenges in this home, but Zack took care of them all and at a great value for the homeowner too. If you just had a toilet overflow in your home and you want Zack and the water damage Inglewood team to take care of it for you, then contact the water damage Inglewood professionals with 911 Restoration Los Angeles today and get all the help you need immediately!